人形 Ningyo = doll. That’s the easy part. What have come to be called Ichimatsu dolls were first produced in the Kampô and Hôreki eras (1741 – 1764), the faces designed to resemble Sanogawa Ichimatsu, a Kabuki actor who was famous for his portrayal of young men. 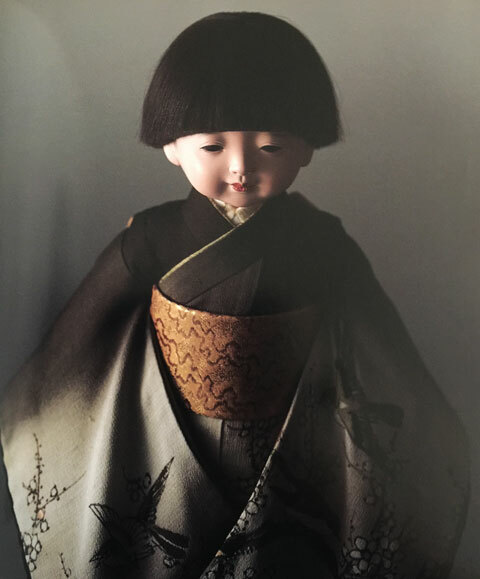 There may have been similar kinds of dolls before then, but those with the face of Ichimatsu became extremely popular, and eventually all dolls of this kind came to be called Ichimatsu dolls. These dolls were made with moveable joints so they could be posed in different ways and dressed in various costumes. Over time such dolls came to be made to look like small boys and girls, and had great appeal. No two are alike as each is hand made, one piece at a time. Children made clothes for them, played with them, and as adults passed them down to their own children. The practice of making doll clothes is a great way to learn how to make your own clothing. 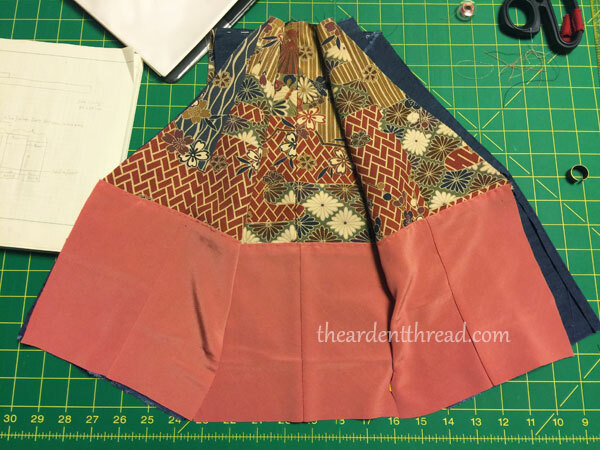 I’ve been taking kimono apart for 10 years and I’ve made several miniature kimono as well, but the scale of this particular kimono is proving to be particularly educational. Understanding why certain seams are sewn twice, where the linings match up inside, and how it all goes together is a lot to learn. 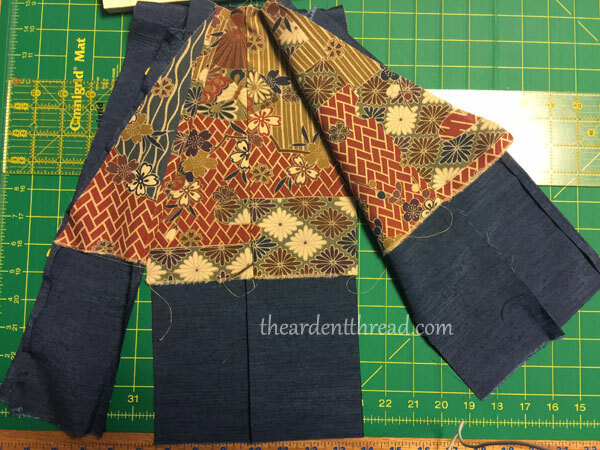 I have “ORDER OF OPERATIONS?” as a note to self scribbled on several pages already as I keep finding the assembly of kimono to be far more complex than the minis I’ve fiddles around with for years. The past two days I’ve worked solely on the lining. I had several scraps to choose from but after doing the math I found only one was large enough to do what I needed for the lower lining and none for the upper one. I raided my stash of kimono bolts (over 100 in silk, so yes, I have a lot to choose from) and decided to use a rather bold pattern for the upper lining. This is more typical for the lining of a haori, which is removed when the wearer enters a home and so the lining may be seen, but kimono linings tend to be far more subdued. I am breaking the rule because I can–we’re in California after all–and because I like the idea of having an unusual lining for his otherwise very simple kimono of solid (iromuji) blue. The plain pink silk scrap that turned out to be exactly the right size for what I needed. Graph paper is your friend when it comes to drafting patterns, and having it on hand meant I could map out exactly what I needed to cut. I even had a tiny scrap left over! Very proud of myself there. This was my work table around midnight. Note the multiple measuring tools, some of them in metric. Tape measures with both US Standard and metric measurements come in handy when working with anything not from the USA, and quite frankly I prefer dealing with centimeters more than fractions of an inch. Back to work for now. 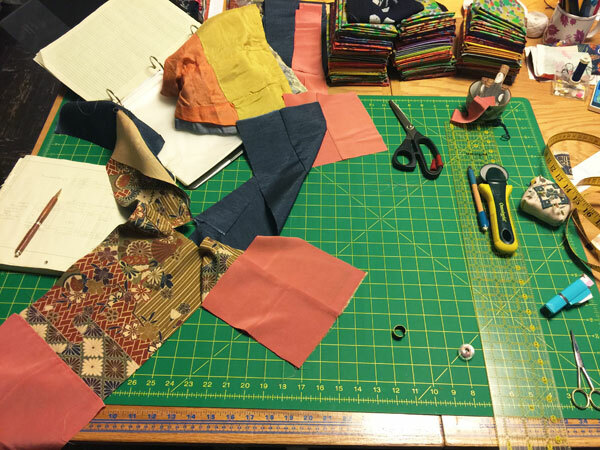 I found a book on making kimono and accessories for Ichimatsu ningyo, but it probably won’t arrive until January so I’m still on my own with the pattern drafting. Less than three weeks to go before New Year! This is fascinating. I love the deconstruction-construction process and following along – all tied to tradition and artistry. Plus I’m keen to play with hand-making dolls’ clothes myself at some time, so this is very educational. Thank you for sharing as you go! Indeed, this is very interesting. Thanks for sharing both the history and your sewing process. A question: I’ve seen many a kimono with a pale pink lining, on the lower half, as you have done here. Is there any reason for the pink color, is this standard Indicative of something in particular? To be honest, I’m not entirely sure. I suspect it has something to do with linings for women often being bright red in the past, but we don’t see much of that past WWII and chemical red dyes from the early 20th century bleed like crazy. Natural red dyes tend to fade gently over time, maybe that influenced the trend toward pink? His original lining colors were orange and yellow, neither of which I had a good set of silks for as they are less popular now than in the 19th century. I’ll look into your question and see what I can find. Thank you for asking!